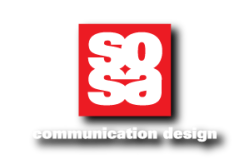 The SosaGroup integrates traditional graphic design principles, current media technology and Street-smarts to create cohesive, compelling and innovative marketing communication solutions that get reactions and results. We are a competent communication design company that's full of creative attitude and action! We're not big, but we are sharp. We get reactions, and results from everything we do. Our strength lies in blending the best of business strategy, design, marketing, and project management principles, to deliver amazing results for our clients. This multi-faceted and direct approach to design has made us a trusted partner in the local business community. If you need and want results, you've come to the right place.